This was the first time I had ever tried a lamington, I had heard of them of course, but never thought to try making them. Which is one reason why I enjoy being part of the Daring Bakers – it encourages me to try things that I wouldn’t think to (or have heard of) on my own, most of which I end up loving. For those of you who haven’t heard of lamingtons, they are a very popular Australian treat consisting of squares of vanilla sponge cake dipped in chocolate icing and rolled in desiccated coconut, sometimes with a jam filling…. For the month of January Jelena from A Kingdom for a Cake invited us to start this year with a dreamy celebration cake. She challenged us to make the Esterhazy cake a.k.a the Hungarian dream. What better way to start the year than with a sweet dream? This months daring bakers challenge was an Esterhazy torte – a rich Hungarian cake comprised of five layers of toasted hazelnut dacquoise filled with a hazelnut buttercream made with egg yolks which is traditionally topped with glace icing and a chocolate cobweb pattern. I decided to change things up a little bit because I thought that the traditional recipe was a little lacking in something…chocolate! Because why have a plain hazelnut cake when you can have a chocolate hazelnut cake…?! And I am very glad I did change the recipe because the cake ended up tasting like a giant Ferrero Rocher! So I decided to join the Daring Bakers, a monthly baking challenge, as I thought that it would encourage me to try baking things that I wouldn’t have thought of on my own. I was right! My first challenge was Paris Brest, a choux pastry dessert filled with a praline cream. It was invented to commemorate the Paris-Brest bicycle race and the circular shape, made with pâte à choux, is meant to resemble a bicycle wheel. 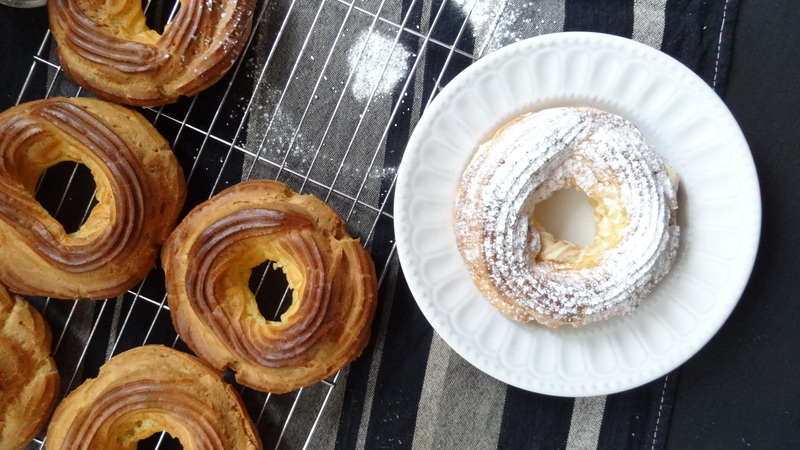 I would have thought to make other choux pastry desserts, but most likely eclairs or profiteroles, not Paris Brest, so this was a good challenge for me….